Note: This is a very long post by Homer's Travels' standards. Be warned. 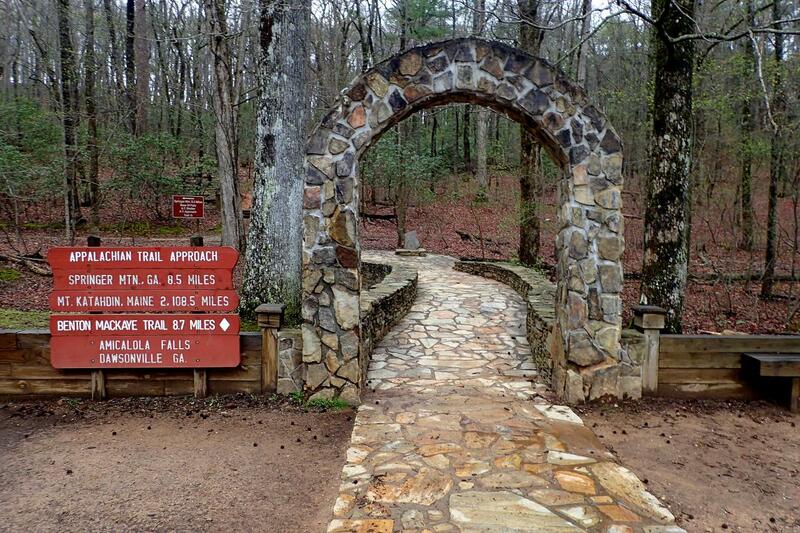 The arch marking the Appalachian Trail Approach. The Appalachian Trail (AT) officially starts on the top of Springer Mountain in northern Georgia. A common practice, one that I followed, is to start at Amicalola Falls State Park and hike the AT Approach trail up to the top of Springer. I was picked up by my shuttle service and, after picking up a hiker from Switzerland at hotel, I was dropped off at the Amicalola Falls Visitor center. I went inside and filled out the AT registry. I went back outside so I could weigh my backpack. I should have gotten the clue that my pack was too heavy when it took me three attempts to lift my pack up to hook it on the scales. It was around forty-eight pounds. I went back inside, bought a magnet, and went out the back of the visitor's center. A stone arch marks the start of the AT Approach. I got my picture taken in front of the arch and headed up the trail in the light drizzle. The first challenge of a very hard day were the stairs up to the top of the falls. 600+ stairs. With forty-eight pounds on my back. It took me a while to make it up to the top of the falls. I rested at the top and took in the view. At the top the AT Approach becomes a dirt trail up the mountain. I met a few people on the way up to the top. Most passed me as I shuffled up the trail. Others I passed. I met Quiver, my first repeat through hiker. He was a bit quirky with his shaved head and red mutton chops but he was nice and friendly. 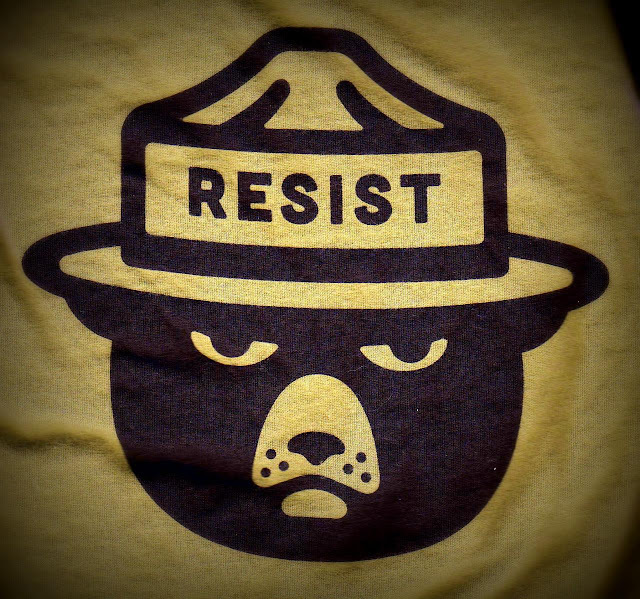 I would see him nearly every day I was on the trail. As I climbed slowly the drizzle came and went. I was nice and dry in my Ferrino Trekker raincoat (I discovered the trick of how to put it on without it getting hung up on the backpack). A's I climbed higher the rain turned to sleet. Nearer to the top I came upon a hiker in distress. He was being helped by a father-son duo. The hiker was not prepared for the cold and they had called 911. Once I was sure everything was okay I continued up the mountain. The father-son duo caught up with me soon after. We walked together on and off until we reached the top. At the top the official southern terminus of the AT is marked with a plaque. 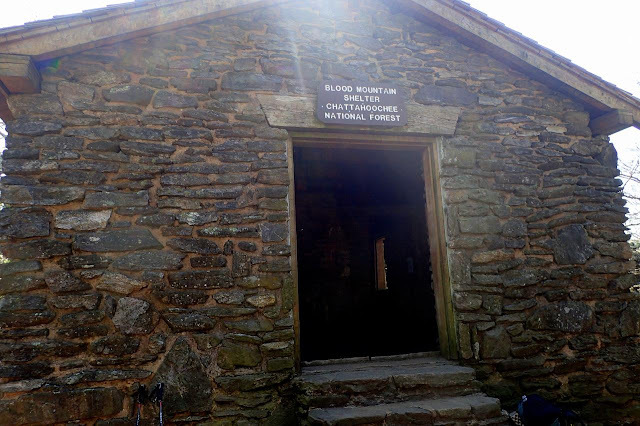 Not far from there, on a blue blazed side trail, was Springer Mountain shelter. It was almost full when we arrived. I ended up getting the last space. Other people pitched their tents and braved the cold wind. The rest of the night was making dinner, filtering water, and chatting with the other people in the shelter. I, and everyone else, was in our sleeping bags before 7:00pm. It was cold that night but the shelter was facing away from the frigid wind and I was in my sleeping bag, bag liner, base layers, and light down coat. I was nice and comfy all night ... despite the skittering of mice in the middle of the night (which is why our food was safe in the bear box). The shelter began to stir around 7:00am. 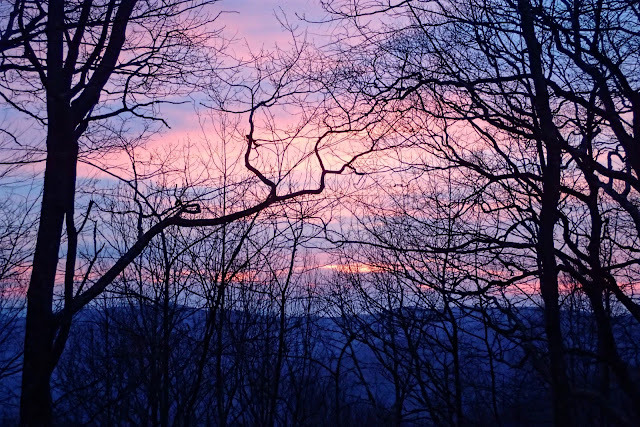 The sun was just rising and it was chilly, probably near freezing. I got up, packed my stuff, and got ready for what was going to be a 14 mile (22.5 km) day. 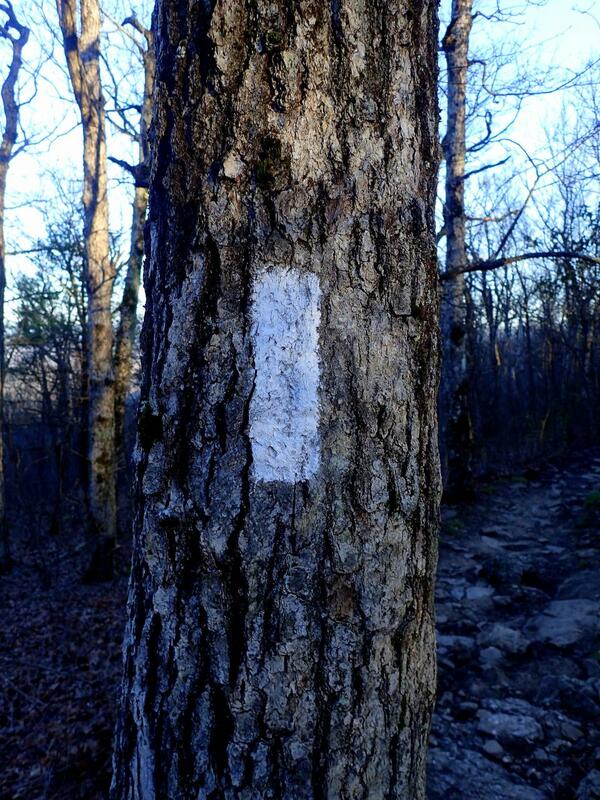 The white blaze that marks the Appalachian Trail. I headed to the AT and saw my first white blaze, the white stripe of paint on trees that mark the AT. 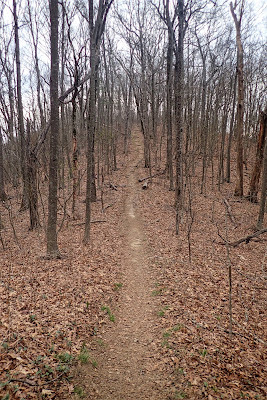 The first part of the day was relatively easy as you headed down Springer mountain but soon thereafter you learn that the trail went over the top of every mountain it encountered. I met a ridge runner - a ranger who walked the trails - and I chatted with him about the trail conditions to my destination of Justus Creek campsites. He said it would be hard until Hawk Mountain shelter but after that it would get easier, he recommended I get water before Hawk Mountain shelter, and he said there were several single campsites along the trail if I found I couldn't make my goal. I arrived at the water source, a nice running creek. There were several hikers here filling their water bottle and filtering. I filled up my water and ate a snack. It was probably here that I realized that I wasn't eating as much as I should but the lack of appetite made eating a chore. I should have been more diligent at forcing myself to eat. People kept saying my appetite would return around day five or six. It didn't return until I got to town. After Hawk Mountain shelter the trail was up and down over and over again. It didn't feel any easier. 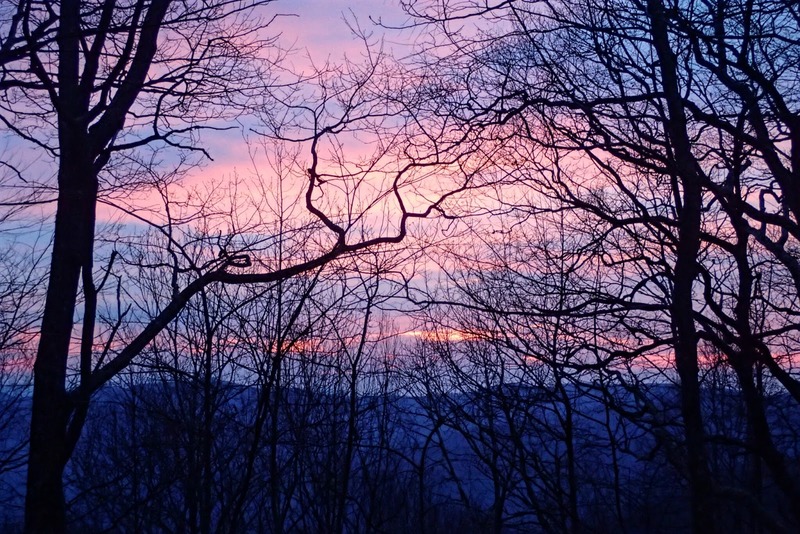 I finally gave in to my exhaustion when I arrived at Cooper Gap. There were a three hikers there already. One was a hippy type who was singing to himself. The other two were a pastor and his teenage son (along with their little dog Duke). I found a somewhat level spot, set up my tent for the first time on the AT, and ate dinner. After eating I wondered about hanging my food. I walked over to the pastor and son and asked it they were planning to hang their bags. We decided it was probably the proper thing to do. I pulled out the cord I'd carefully coiled before leaving home. The cord was one huge gordian knot. After wrestling with it I managed to get enough line loose to hang the bag. It was ugly with a messy knot in the middle but it worked and my food bag was soon swinging from a tree branch. I ended up in my tent around 8:00pm and slept well most of the night. I got up with the sun again, broke camp and headed up the next mountain. First stop of the day was Justus Creek where I filled up my water bottles. Up and down the mountains I went. Near the top of one a large rock outcropping invited people to rest and enjoy the views. I did just that along with eating lunch - Tyson chicken, olive oil, and a tortilla - one of my better meals actually. The Pastor, his son, and Duke showed up soon after and we finally exchanged names (I knew Duke's name before the Pastor's or his son's). We chatted a little and ended up walking together on and off the rest of the day. They walked a little faster than I did but I usually caught up with them when they were resting. The weather was beautiful and the views went on forever. I arrived at my destination, Lance Creek, and Pastor and son were waiting for me. The campground was full but there was an old road that provided several more spots to set up our camps. I put up my tent, filtered some water, and ate some chicken and noodles. I was too tired to socialize much. I tried but I was just too pooped. I went to hang my food and tried to wrestle with the damn knot but gave up again. I ended up cutting the knot out and tying the two longest pieces together. I know this wasn't the best way to do this but I was too tired to fight this knot and frustration led me to my crazy solution. I crawled into my tent and went to sleep. I woke up early. I got out of my tent just after 6:00am. It was still dark. I noticed a few bright stars through the heavy canopy of trees. That is one thing I wish I'd done, I never took the time to stay up and look at the stars. I was always too tired to stay up. I left Lance Creek around 7:00am and, once again, headed up the next mountain. Today I would climb the tallest mountain on the Georgia section of the AT - Blood Mountain. It took me a long time with many stops on the way up. Every large rock, log, or stump seemed to dare me to sit on them and I almost always took the dare. On the way up I met Journey who was walking with her son's dog Tundra. The dog was too undisciplined for this hike. It kept stopping to smell things and really slowed Journey down. On top of that she was carrying water, food, and CLOTHING for the dog. There were quite a few people hiking with their dogs. The more well behaved dogs did add companionship and they also scared off bears. I made it to the top where the stone Blood Mountain shelter stood. I took some pictures and sat on a rock to eat lunch. The Pastor, son, and Duke showed up soon after. Most shelters are made of wood. This was my first stone shelter. I got a bit lost leaving the shelter. It took a couple tries to find the white blaze. Journey and I headed down the rocky trail. We were following some day hikers who, unfortunately, took a wrong turn. This resulted in Journey and I heading down a very steep rock face before realizing we were going the wrong way. We turned around and climbed carefully back up the steep rock until we got back to the marked trail. This did nothing for my energy level. Going down Blood Mountain was not fun. You were constantly stepping down from rock to rock over roots and other things that did a number on the ol' knees. It didn't help when Tundra broke loose and scared a little girl to death. He almost made Journey fall off a rock and I scrambled to grab his leash. I spent the rest of the time mumbling to myself swearing at the rocks and roots. I was totally done. When I finally reached Neels Gap I saw the Pastor sitting with his son and his family (who had met him there) and I said "I. Am. Done!!!" There is a large tree outside Mountain Crossings full of shoes hanging from its branches. These are the shoes of hikers who couldn't make it past day four. I was tempted to toss my shoes up there. The pastor helped talk myself down from the ledge. I decided I would try to lighten my pack and I would take a zero day at the Mountain Crossings hostel. I checked into the hostel (along with a couple sick hikers, including Quiver). I hauled my pack into the Mountain Crossings store and asked for a pack shakedown. The guy went through all my stuff. He was very impressed with the equipment I was carrying. He said it was what he would have picked. He suggested I stop in Hiawassee to resupply so I didn't need to carry so much food. He pointed out several things that I really didn't need. He handed me a box to fill. I decided to go through my food and stuff the next day when I was rested and had time to think. Note: The Pastor had hurt his knee that day and headed home to rest it. He never returned. He was only a section hiker and he wasn't far from his home. I woke up at 8:00am when the Mountain Crossings guy came in and told everyone to be out by 9:00am. I asked about doing a zero day and he said they didn't do zero days here. CRAP. This was my fault since I didn't ask. I could have walked to some cabins just down the road and spend a zero there but I decided not to. This may or may not have been a mistake. I scrambled and went through my gear throwing stuff into the box. I put some food into the hiker box and threw other food into the trash. I took the box to the store and shipped it home - it was almost 6 lbs (2.7 kg). With the reduced food I think I was around 10 lbs (4.5 kg) lighter than when I started back on day one. I headed out ... up the mountain. It was nearly 9:00am, my latest start. Despite it being lighter my backpack still felt heavy and my legs continued to complain all day. I caught up with a couple of guys I'd briefly met at Lance Creek (They thought they'd met me before but were mistaken). They were Gargoyle and One Step At A Time (or Blue Bunny - he carried his child's blue bunny) We ended up walking together most of the day. Our goal for the day was Low Gap shelter but I could tell I wasn't going to make it. My legs just weren't in it today. We reached Hogback Gap and refilled our water. In the parking lot a guy was giving out trail magic - water in this case. I'd seen the same guy at Neels Gap with a cooler full of beer. This was my first trail magic. We headed up the next hill and I told Gargoyle and Blue Bunny that I was near my limit and I would be stopping soon. There were campsites along the trail, usually at the high and low points. Since I was heading uphill I knew there would be a campsite soon enough. I skipped the first one I passed. I still hoped to keep going. The second campsite I passed was the one for me. I put up camp and took a nap in my tent for an hour or so before getting back up to eat dinner. It would be another early night for me. I decided I was going to get off the trail in a couple days. I got up at 7:00am and headed out up the mountain. I arrived at Low Gap shelter a bit later where I found Gargoyle and Blue Bunny. They hadn't made it much farther than I had having camped at the top of the mountain a mile or so past where I'd stopped. I used the shelter facilities and refilled my water bottles. I left with Gargoyle and Blue Bunny. I decided to stay with them the rest of the day. They had a good pace for me. Not too fast and with enough breaks on the uphill portions. We stopped at a creek with multiple cascades. We filled up our water bottles and ate lunch. As I ate and rested a lady from Texas showed up. She was Lucky Star. I once again didn't eat enough. The next stop of the day was another stream near the end of the day. We knew there wasn't any water at the shelter so we refilled our bottles again. Filling water bottles and filtering water is a multiple times per day thing on the AT. Near the top of Blue Mountain we arrived at Blue Mountain shelter. There were three hiker there who were giving away food and supplies because they were quitting early. One of their group was hurt and they needed to get off the trail. I took a granola bar. Lucky Star showed up along with several other hikers. A French hiker was at the shelter and, strangely enough, was taking a couple zero days at the shelter to rest a ligament issue. Not sure why he didn't go into Hiawassee for the zero days. A hiker showed up with his dog Bear and a tub full of beer. He said that he'd heard that there wasn't very much trail magic lately so he hiked up the mountain with the beer to share with AT hikers. They lit a fire in the fire pit (the first fire on my AT) and everyone relaxed and told stories. I hung back. I was too tired and I ... I wasn't there. I was physically on the trail but my heart wasn't. I called the Budget Inn in Hiawassee and made a reservation before I crawled into my sleeping bag. I got up at 7:00am, packed up, and admired the beautiful sunrise. It would be my last on the AT. I said my goodbyes and headed down Blue Mountain. I think I made it down in record time. It felt a lot easier than all the other days. I know it was an illusion because it was all downhill and I knew it would be over soon. I reached the parking lot, took off my pack and waited for the Budget Inn shuttle. As I waited Gargoyle and Blue Bunny showed up. They were happy to see me because, on the downhill, they decided to take a zero day in Hiawassee and, since I was still there, they hadn't missed the 9:00am shuttle. The shuttle picked us up and driver Bob told us about Hiawassee during the 10 mile drive into town. I checked in, took a warm shower, and headed over to the Subway next door for lunch. The Dairy Queen was hit around 3:00pm. It seems once I got into town my appetite had come back full force. The rest of the afternoon was spent making airplane and hotel reservations and finding a shuttle to get me down to Atlanta from Hiawassee. I started some laundry and, meeting up with Gargoyle, Blue Bunny, Lucky Star, and Becca, headed "downtown" in search of Daniel's Steakhouse home of the all you could eat buffet. We found the place and loaded up with everything they had. Since I was leaving the AT I footed the bill for all five of us (a whopping $54 plus tip - dirt cheap). It was sad my Trail Family began to form on the day I left. I ended up giving and selling some stuff to Gargoyle and Blue Bunny. I said my good nights and byes before going to bed. And that was the end of my Appalachian Trail adventure. 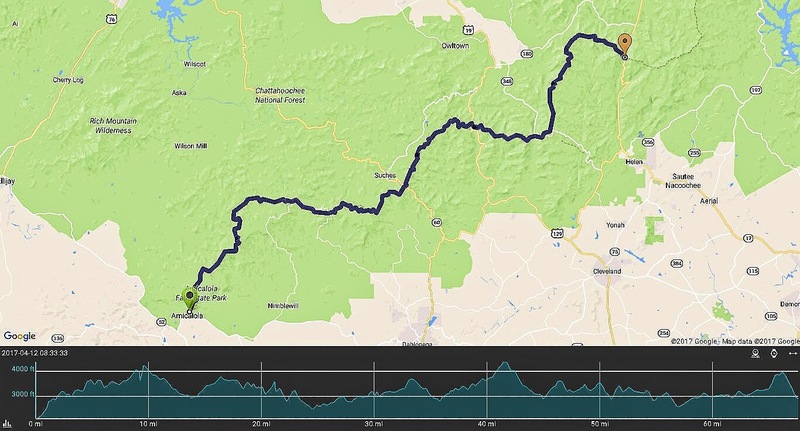 Map of my AT from Amicalola Falls state park to Unicoi Gap. I didn't take that many pictures and, in fact, took only one picture on days five and six (and it was bad). I think I was already checking out. The best pictures I took can be found in my 2017-04 Appalachian Trail Google Photos album. 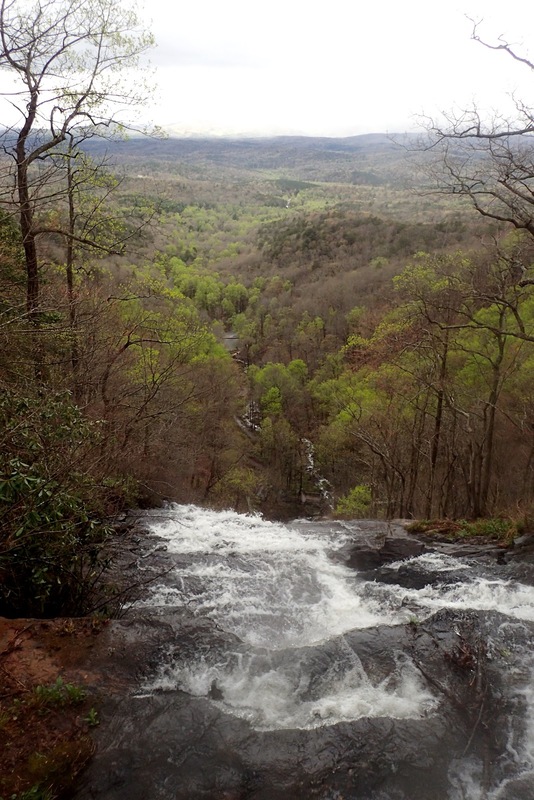 It's day seven and I am off the trail in Hiawassee, GA. The last six days have not been good. Except for the first day, the weather has been beautiful and the people are the friendliest but, frankly, my heart isn't in it. The end of the trail for me. The last six days has been like my worst day hiking, times six, back to back. The days are unending. What was once my favorite activity became an ordeal. Everyone around me seemed to be having a wonderful time and enjoying everything​ about the experience. I was exhausted and miserable. I was not having fun. I almost quit on day four but decided​ to try a few more days with a lighter pack but it just didn't get better despite meeting some awesome hiking partners that kept me going when the going was tough. The thought of over one hundred sixty more days of this makes me cringe. Therefore, I am ending my adventure and coming home. Despite the wonderful people I met and the beautiful views along the trail, the physical challenge of the Appalachian Trail (AT) was stronger than my stubbornness. Instead of spiritual healing, the AT broke my spirit. I apologize to everyone who were planning to follow me along the trail. I know I let some people down. I surely let myself down. I am embarrassed and ashamed I gave up so quickly. I also must confess that I am a little bit relieved as well. I am so sorry. My last AT sunrise from Blue Mountain Shelter. It's time to step away from Homer's Travels for a short while to regroup. April 4, 2017 - Traveled to Dahlonega, GA where I will be prepping for my AT hike on the 6th. I was concerned that my backpack would not fit in the overhead. I worry about everything. I was seated in an exit row and one perk of that is you board relatively early so I had an empty overhead bin near my seat. Turned out my backpack fit easily. My flight left on time. Ended up having the whole exit row to myself. I didn't have anything to read so it was a rather boring two hour and fifteen minute flight. Arrived in Atlanta fifteen minutes early and picked up my checked bag (with all the liquids and pointy things that worry the TSA) which was the first one off and headed for the MARTA train station. I bought my ticket and boarded the waiting North Spring train one minute before it left. From there I took the train to the North Spring Station. I ended up getting to the station forty-five minutes early due to all my luck today. I was picked up here by my shuttle guy and he drove me to my hotel in Dahlonega. The guy was full of good information. There were three other thru-hikers in the guy's 4Runner who were starting from Springer Mountain the same afternoon. I got my first stamp in my Appalachian Trail passport from the shuttle driver. The forecast called for rain on Wednesday when I'd planned on going to the outfitters to buy fuel and other non-flyable hazardous stuff. Since it was still early and the weather was nice, I went to the outfitters a day early. Dahlonega is a nice historic town. There were a lot of people out enjoying the warm weather before the storm. April 5, 2017 - Rainy day in Georgia. It was a rainy day in Dahlonega so I considered just staying in my room all day and pack/repack my bag. The hotel had breakfast but I would need to get out for lunch and dinner. This would be my last chance for real food for eleven days - I needed to take advantage of my time in civilization. My rain gear would get tested before I got on the trail. I walked​ to the nice downtown area and had a sandwich in a cafe. My rain coat did a good job at keeping me dry. Tomorrow the rain will be showers and there will be a lot of wind. Not sure I will be as dry when I get to Springer Mountain shelter tomorrow. I did pack and repack my backpack a few times Wednesday. That is to be expected. I also spent the day checking the weather. I will probably walk through showers but that is not what is worrying me. Wind. It will be blowing 20+ mph tomorrow. I'm not sure if I'm ready for this ... But I will find out if I'm ready soon enough ... Tomorrow in fact. "I will be walking the AT and I'm taking your picture with me so we will walk the AT together." Her father said he didn't know what I'd said but her eyes had brightened. Those were my last words to Gen. With these words I'd made a promise and had given myself another reason to do the Appalachian Trail (AT). Along with the physical challenge and the spiritual healing, reasons I mentioned last post, I now have a promise to keep. I am carrying a small picture of Gen tucked inside my AT Passport. On the back of the picture is an English translation of a poem that Gen recorded for her memorial. The poem was written by Charlotte Néwashish-Flamand, a Native American. I could not find very much information about her but I do know she wrote it when her Uncle died and she passed away not long after. When I'm gone, let me go. Let me go, I have so much to do and see. Do not cry while thinking of me, be grateful for the beautiful years, I have given you my friendship, you can only guess the happiness you have brought me. I thank you for the Love that everyone has shown me, now it's time to travel alone. For a short time, you may have trouble. Faith will bring you comfort and consolation. We will be separated for a while. If you need it, call me and I'll come. Even if you can not see me or touch me, I'll be there. the sweetness of love that I will bring. And when it's time for you to leave, I'll be there to greet you. Absent from my body, present with God. Do not go to my grave to cry, I'm not there, I do not sleep. I am the light that crosses the fields of wheat. I am the sweet autumn rain. I am the awakening of the birds in the calm of the morning. I am the one who shines in the night. Today I'm flying to Georgia, to the beginning of the Appalachian Trail (AT). Why am I doing it? Why am I hiking the AT? I have been asked a few times. I usually give some vague answer because I hadn't really given it the thought it deserved. Here is where the idea of walking the AT came from. It goes back six years. In 2011 I did my first Camino de Santiago. The Camino would be the most challenging thing I'd ever done up to that point in my life. The Camino challenged me physically and mentally and changed me. It taught me that I liked to walk long distances and it taught me the satisfaction of achieving a demanding goal. They say that once you complete the Camino you don't want to stop walking. There is some truth to that. Do the Camino again in 2013. My first Camino always felt incomplete - partially because I skipped a couple days on a bus and I skipped the sunset at the end of the Camino. I set out on my second Camino on a slightly different route and I finished it without skipping any part this time. I reached the end in Fisterra, sat on the rocks near Faro Fisterra, and watched the sun go down. The sunset was what I'd missed the first Camino. As I sat there I felt the feeling of completeness that I missed the first time. It gave me the feeling I was searching for. Do RAGBRAI in 2015. Even though I wasn't much of a bike rider I decided to do the ride across Iowa. I trained for it and in July 2015 I biked over four hundred miles from the Missouri River, across Iowa, to the Mississippi River. It was tough but I managed it better than I'd expected. I was satisfied with how I'd done it even though I decided that I didn't really like riding a bike long distances. I was a hiker not a biker. Despite not enjoying riding, I did feel satisfaction as I pulled into the destination town each day. When I dipped my tire into the Mississippi River it almost felt like the sunset at Fisterra. Thru-hike the AT in 2017. The AT, for me, is the ultimate challenge. Nearly the length of four Caminos and without the support infrastructure that the Camino has, it is a challenge both physically and mentally. So one of the reasons I am doing the AT is the Camino-born need for a physical challenge, a challenge like I have never attempted, and the feeling of satisfaction I will feel once I have reached Katahdin Mountain. But, the physical challenge is only a part of what is motivating me. There is the spiritual. My Camino began as a physical challenge but over time and miles it morphed into something I'd not anticipated. Days walking drives your thoughts inward and you find yourself exploring all the thoughts buried deep in your mind. You are forced to acknowledge things about yourself. It changes your perspective. It is a very spiritual experience. Before my Camino I didn't know what I really was searching for. I thought it was purely a physical challenge but I was only partially right. I found the rest of the answer on those rocks on Cabo Fisterra. The accomplishment I felt as the sun set was the spiritual healing that I'd been seeking all along. But nothing is permanent. The last year has taken its toll on me. I can feel that I am askew. I'm coasting. I'm not engaging like I once did. I feel a little lost. Spiritually I feel beaten down. So, I am hiking the AT in the hope it will fill the role the Camino once served. I walk into the forest to receive spiritual healing. I look to the wilderness trail to straighten my path so I can renew my purpose, engage with me so I can engage with life, and heal my spirit so I can move on. I would like to end this post with a poem. It is a repost of a poem written by one of the Wife's students (originally posted May 03, 2013). It truly encompasses how I feel when I'm hiking.